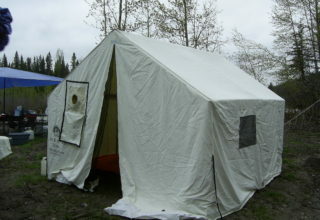 Custom-Made Tarps Edmonton | Specialties | Edmonton Tent & Awning 2000 Inc.
10 oz. cotton canvas off white or tan Flame Retardant (FR) treatment to CPAI-84 by Canvas Products Association International. Stove pipe ring 4″, 5″ or 6″ diameter with flap (ring located on 18″ x 18″ square design to withst and the extremely high temperatures associated with the use of a single wall stove pipe). 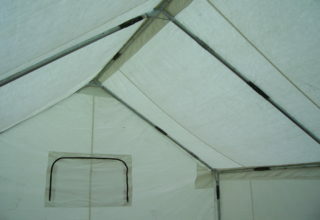 Full-length ridge pole reinforcement with additional reinforcement at the gable ends. 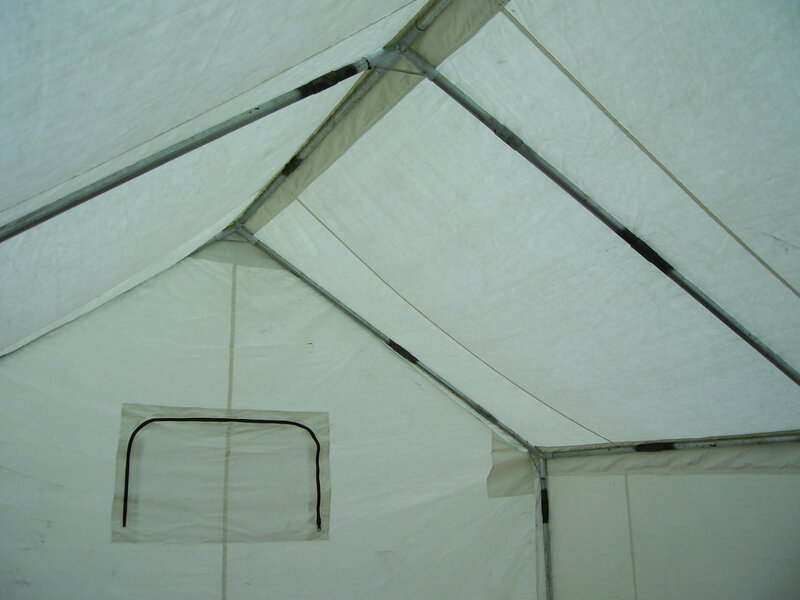 Eaves constructed of a double layer of canvas, double stitched. walls and down from peak. 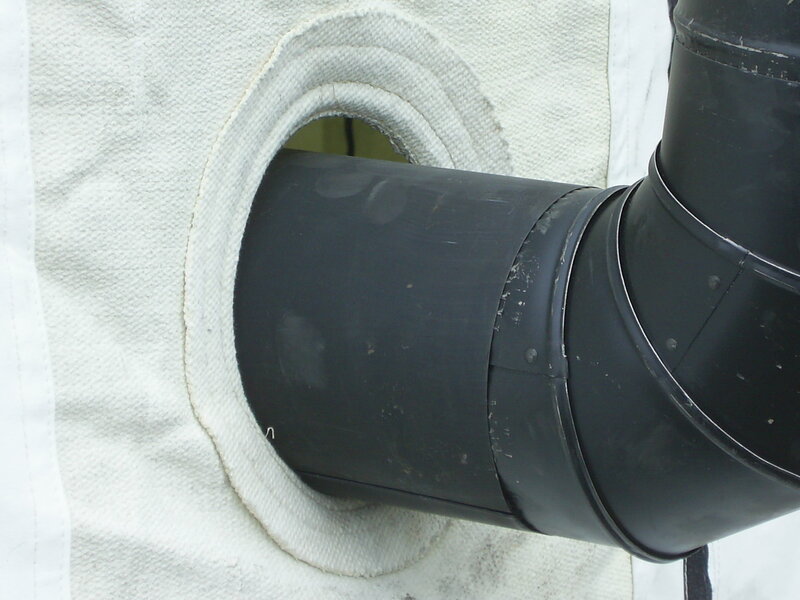 All grommets of the spur type allowing for a generous inside diameter of 9/16″ – non-rusting (eyelets hand set to accommodate various thickness of canvas). All guy ropes spliced into eave grommets (no rusting steel clamps or bull rings). 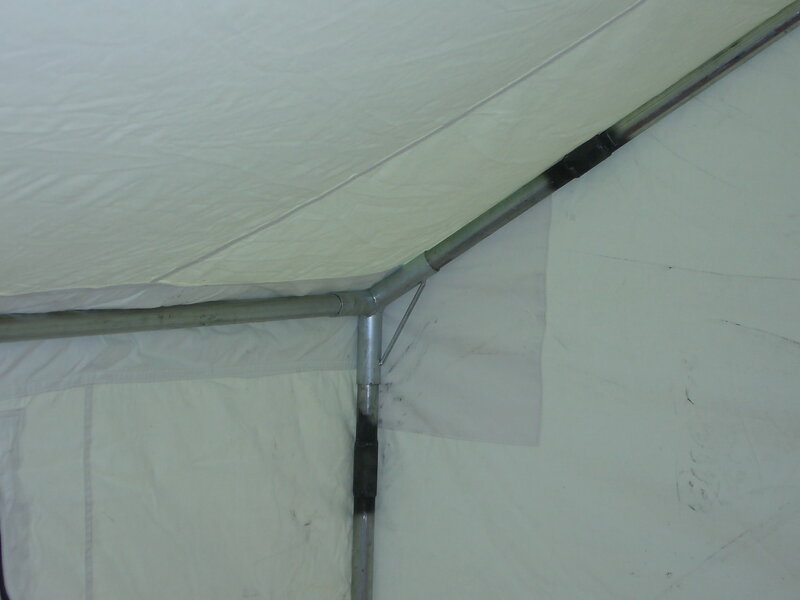 Base of tent finished off with a generous 14″ sod cloth – moisture-resistant fabrene. Peg loops of 1″ nylon located 3’0″ on center + or -. 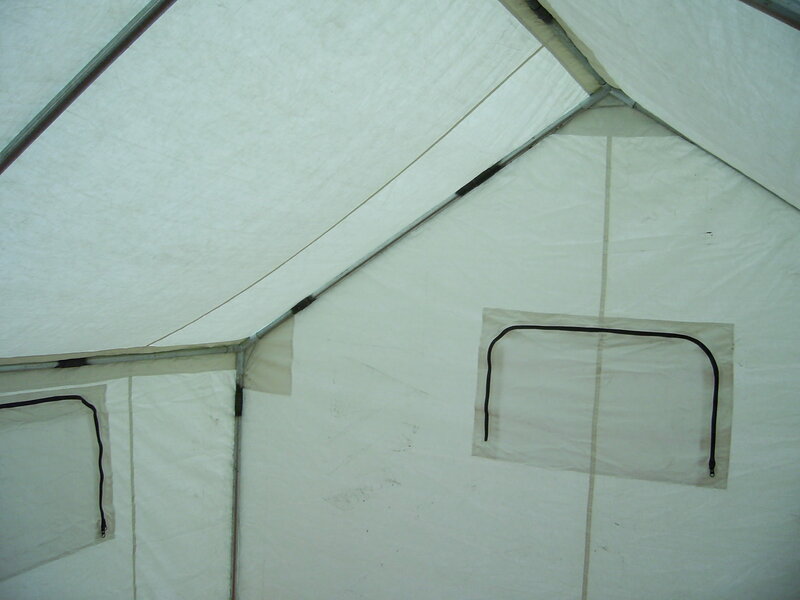 Tie back door flap with a 12″ overlap typical door height 7’0″ – 7’6″. Guy rope sliders 7/8″ diameter wood. Web ties along peak (inside) to accommodate drying rail. 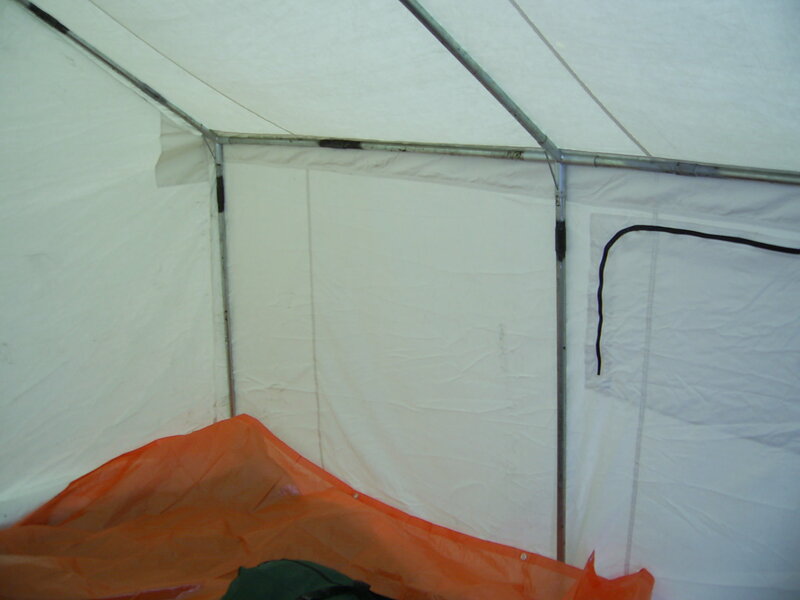 Full netting door with heavy-duty zipper. 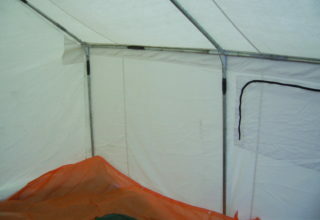 1/2 netting door with heavy-duty zipper. Screen window with zippered canvas flap. 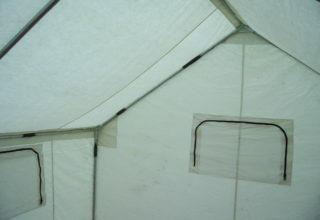 Screen window with zippered plastic and canvas flap. 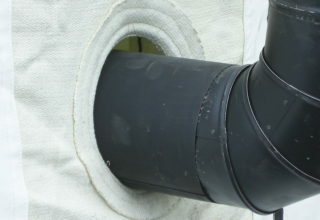 Common window size 20″ x 30″ wide; vent in back end wall for no windows models. 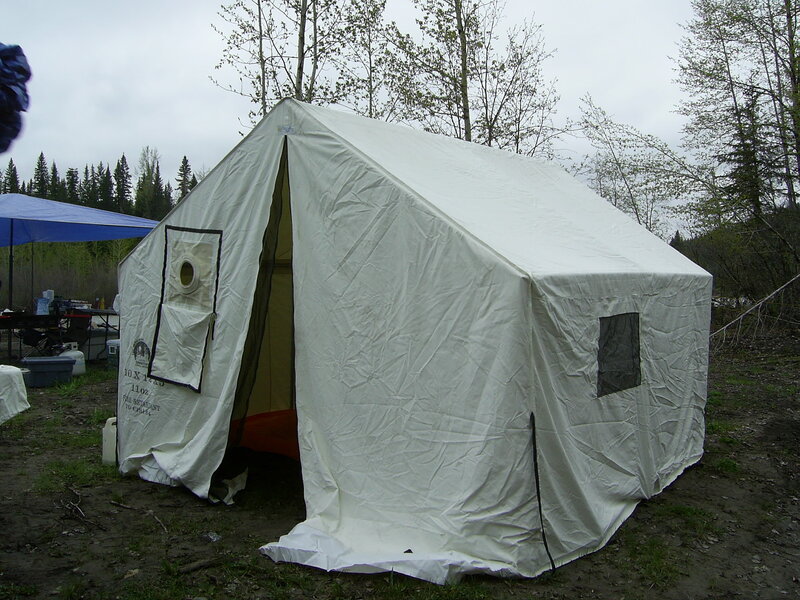 Tent fly adds extra insulation and helps repel rain and snow in extreme weather conditions. Logo / name stenciled on bag and tent; sewn in floor of 14 oz vinyl or canvas (reduces chance of theft).